Better-off parents are choosing a public school instead of an independent, reversing the drift towards private that has worried educators and commentators. According to an analysis by the Bureau of Statistics for Fairfax Newspapers, government school enrolments have increased proportionately by almost 7 per cent since 2006. 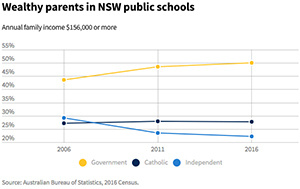 In NSW a decade ago 43.6 per cent of parents were sending their children to public schools but 50 per cent of families earning over $156,000 have since have switched to the public system. Private schools' share is down from 29 per cent in 2006 to 22 per cent and 27.8 per cent of children are now attending Catholic schools. 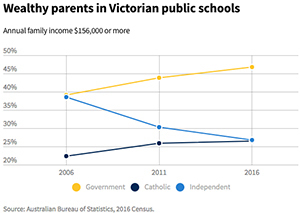 In Victoria, there there are now proportionally 12 per cent fewer children in independent schools compared to 2006, with 8 per cent more in public schools and 4 per cent extra in the Catholic system. The drift to public education is national and is set to heap pressure on state public school systems.